Christmas is one of my favourite times of the year for baking, and I have been so excited to make this cake. 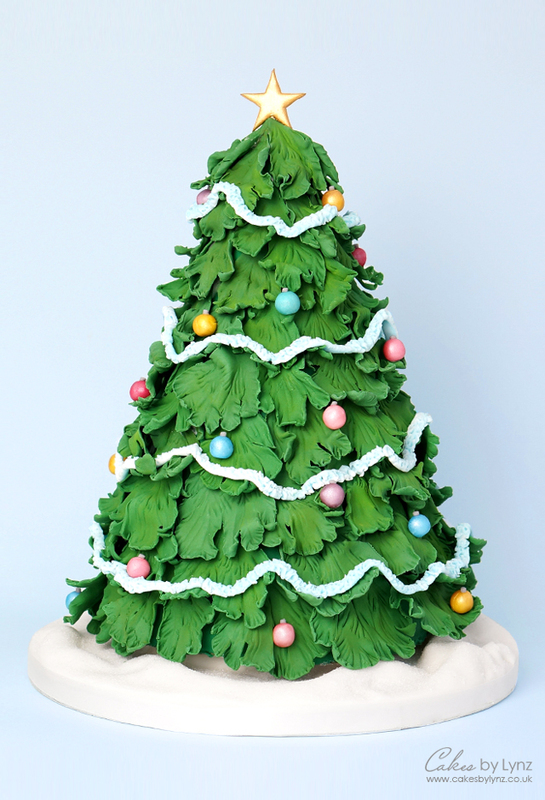 I wanted to create a cake which really showed the spirit of Christmas and what better represents Christmas than a Christmas Tree. 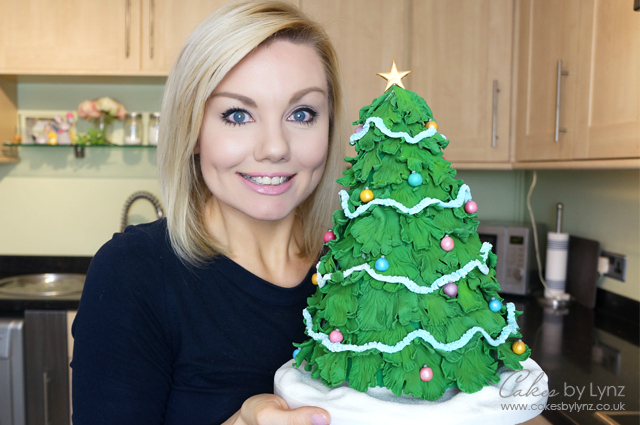 So in this weeks video tutorial I show you step by step how I made this Christmas Tree cake which stands at 12 inches tall. I had so much fun making this cake! 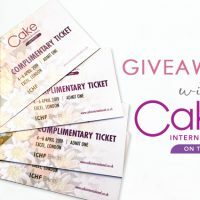 The cake itself is made from 3 – 6 inch vanilla sponge cakes stacked up to give a height of 5 inches. These were then carved into the bottom half of the tree. For the top of the cake I used Rice Crispy treats to make the cone. The reason for this was that rice crispy treats are alot easier to mush together into a point than trying to carve cake, and it adds less weight. I then filled and covered the whole cake in chocolate ganache. For the branches I used 3 different sizes of peony cutters. These worked perfectly and once I had added some lines to the edges and through the middle they really started to look like Christmas tree branches. Now I will be honest, if you are thinking of making this cake it does take a little while to make all the branches. In total I made 90 split between the three sizes, but when I could see it all coming together it was totally worth the extra time. I especially loved how by drying the branches over some tissue paper to create a little bit of movement it allowed each row of branches just to come away from the tree and really give a nice shape. The Tree was then covered in edible decorations, including these cute little mini baubles. One of my favourite effects was the snow on the cake board. For this I covered white icing with granulated sugar to look like little heaps of snow, and with the tree on top I loved how this looked. 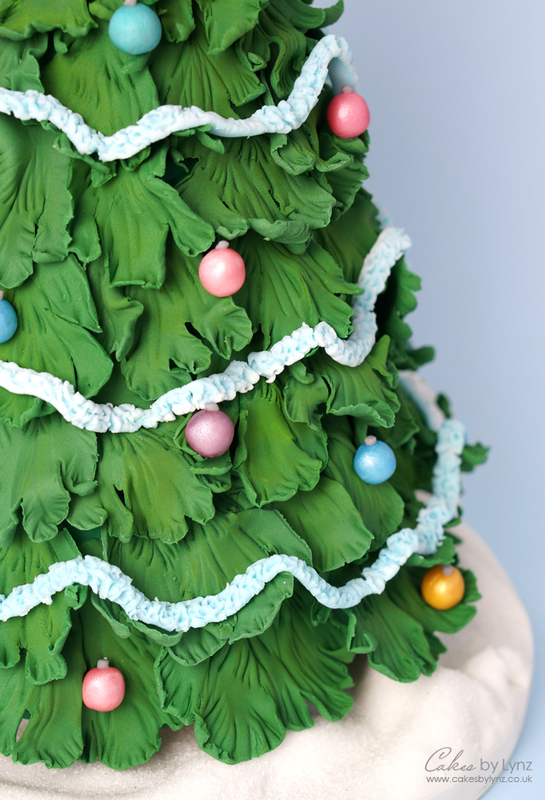 In the video I show you exactly how I carved and moulded the cake, covered the cone in icing, created the board for it to sit on, added the branches and created all the edible decorations. I really hope you enjoy the video and find it useful if you are looking to make a centrepiece Christmas cake this year. Also don’t for get to check out my other Christmas tutorials by visiting my Tutorials page!